I have revisited a text that has blessed us in the past for this month’s message, the fact that we are His workmanship. The fascinating truth is that He is the artist, the maker, the one who fashions and sculpts our lives. He makes us according to the pattern who is Jesus. I believe that this message will activate desires of the Spirit in you to live to the fullest as Christ in this world. April is a very full month for me and for all the staff who are involved in making everything happen! We are having two Bible schools at the beginning and end of the month. The first is the graduation of the present series of modules. We will have been together for 120 hours and a massive amount of truth has been exchanged. Lives have been brought into line with the truth of the love of God in Christ. Congratulations to every graduate! The new cycle of modules starts April 26-27, 2019 – and this first module is more self-contained, laying down what the whole course is leading to union with the Trinity. 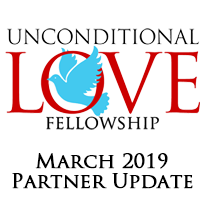 It is titled “Union with the Triune God”; it is the essence of the message that you support each month – the love of God being fulfilled in Christ living in us through the Spirit. It will be practical because we have not studied well until we know how it is lived in daily life. It will take place at the Drury Inn & Suites in San Antonio Near La Cantera Pkwy…Sign up today! We will be in St. Petersburg, Florida on June 7-8, 2019. The retreat starts at 12:00 noon Friday and Saturday (with a breakfast before). Registration for the retreat is $350 per person and will be at the Crystal Bay Resort (7401 Central Avenue St. Petersburg, Florida). To book your room with the hotel and meals, call (727) 914-7676 and let them know you are booking for the Unconditional Love Retreat. Our group rate for the rooms is $90/night and $35/day for meals. The space is limited so please call the office right away to secure a spot. The retreat is “Living in the Fullness of God”. This is a new retreat – not a rehash of the December retreat! It will open your eyes even wider to this incredible life that we are called to in Christ. We are limited in space so call the office today.